All terain detector water proof to 10ft. 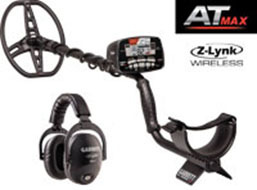 built in Z-lYNK for wireless convience 13.6 kHz operating frequency to detect a wider range of targets- from small goldnuggets gold nuggets, jewelry and silver coins. True all Metal Mode, All Metal Iron Audio. 8.5″ x 11″ DD Coil & Cover, Z-Lynk Wireless Headphones included..